in a sentence or two: Lyra, an outspoken young woman, is growing up in the bowels of a historic university when her whole world changes. 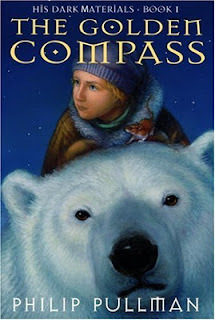 Lyra must go on an adventure to search for the mystery of Dust, and is often encouraged by her comrades - a polar bear, gypsies, and her golden compass. The story starts off in the first pages with sympathetic characters and an intriguing location. Lyra is outspoken, brave, a leader, and has many traits that the reader desires for them self. Her journey towards the mystery behind the kidnappings of children and their relation to Dust introduces more strange characters. While some of these characters are not so loving, the majority of Lyra's companions characters are developed to be compassionate, kind, supportive, and treat her as a peer even though she is so young. The journey is full of ups and downs, and is a bit of an emotional roller coaster for the reader as you travel with her to the unknown, feel her anxiety, and want desperately to be strong like she is through it all. The reader connection with Lyra is easily made, and easily maintained. The ending leaves the reader wanting more, as the first book in a trilogy usually does. It's incredible how drawn into this story the reader can become. 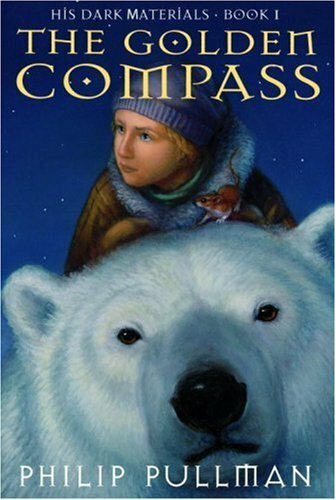 A majority of the tale takes place in the arctic north, and the descriptions of the wind, snow, and cold chill the bones of the reader snuggled up in bed. The connection forged with Lyra is immediate and consistent throughout the novel, and that is largely in part to her nature and to her being the narrator of the story. While the story itself was intriguing and quite a journey, I feel as if the author went off on tangents from time to time in regards to personal interests rather than the story. There is a specific point where Lyra (whom the reader most strongly connects with) is sleeping, and the adults have a conversation. This conversation could have easily been tied into the book to include Lyra (the young adult reader), but was not. The writing is deep, intricate, and calls close attention to detail throughout the novel, so this was especially jarring. There were other points throughout the story where I felt a little bored, or weary of where the story was headed. It definitely picked up in the beginning, parts of the middle, and the end but was by no means consistent. That being said, I am still drawn in enough to read the rest of the series!